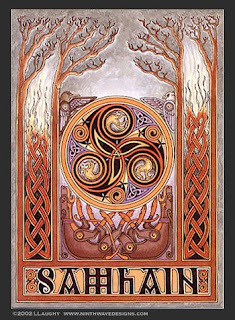 Happy Samhain to you all! The third and final harvest is here, the wheel of the year ends tonight and the new year begins tomorrow. Today the veil between the worlds is thinnest, and those who have crossed over can come back to spend time with family and friends. Enjoy the evening with them, and Blessed Be! The big boy, otherwise known as Bast's Gift or Gift for short, awakened from his nap inside a gigantic Home Goods reusable bag. It's a tough life but someone's got to live it. I tend to read and write sitting in a very comfortable chair rather than at a table or desk, which is a problem if I'm writing because of the lack of surface area to use as backing. I'd been thinking of getting a lap desk, but either didn't like the styles or the price, or both. On a recent trip to Borders I finally found a lap desk I liked aesthetically and price-wise: the Creative Essentials Jumbo LapDesk. The LapDesk, which is available at Barnes and Noble, Staples, Office Depot, Office Max, and other retailers, looks like a giant clipboard. There's a clip on the side for holding papers or notepads; organizer trays for pens, pencils, flash drives, whatever; and the back lap pads contain microbeads designed to divert heat and keep the desk and your lap cooler if you're using this with a laptop computer. Prices vary from about $15 to $19, making this both a great buy and exactly the style I want in a lapdesk. University Stationery on E. 12th Street and University Place is another great old-fashioned stationery story with what looks like miles and miles of notebooks, pads, and journals. It's been around for decades, serving the New York University community. So it stocks quite a lot of pens and paper, as well as a great supply of fine pens kept on the right side of the store (which is quite small). On the left side of the store is the paper, about 45 to 50 feet of shelves worth of paper but only a few brands. The first half of the store is loaded with Clairefontaine and Rhodia. I've seen some Clairefontaine notebooks there that I haven't seen anywhere else, a quite unusual occurrence (such as the flowered notebook on the second shelf to the left in this picture). Then comes some miscellaneous office supplies, which leads to about 25 feet of shelves filled with Miquelrius notepads: four-colored notebooks, one subject notebooks, three subject notebooks, large, small, medium, paper covers, poly covers, solid and plaid covers. I didn't know Miquelrius made this many notebooks! The upper areas of the wall carry various office supplies, planners, and other stationery supplies. The owner of the store was very helpful when I was looking for a Lamy Al-Star converter; he had plenty for the Safari but none for the Al-Star, but he called his warehouse and then sent his son for it. Took about 15 minutes, which unfortunately gave me more time to find a few more things I hadn't seen before to add to my purchase. Definitely another place you could spend lots of time (and $). I was reading through the Pen Addict's blog on the Japanese Zebra, an intriguing animal that comes in many varieties and shades, and read his review of the Zebra Sarasa Stick 0.3m with its interesting needle point. Then off to do some shopping, ending up the afternoon at Kinokuniya looking over their large pen selection. 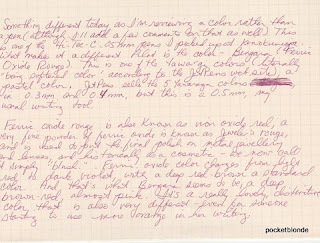 I spotted the Zebra Sarasa Stick pen section, with a large amount of the 0.3m in 8 to 10 different colors. I finally went with blue black, spruce green, and bright blue, then decided to add a Stick pen in 0.7m in blue black as a comparison. The two are so different in both looks and writing that I'm surprised they are both labelled Sarasa Stick pens. The 0.3m pens are all needle points, and feel funny to write with when I'm used to a much wider tip or a rollerball. The blue and green wouldn't write at first, and I spent a good few minutes on each trying to get the ink to flow. When I finally did, I almost couldn't see what I was writing. They were great for making lines, although the blue black is the best color to use just because it is dark and can be seen. 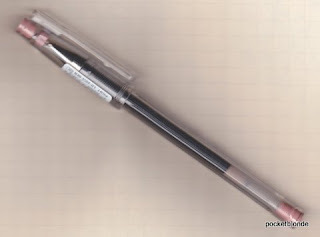 Then there is the Sarasa Stick 0.7m, a different pen altogether. It has a ball point ink refill and writes smoothly, with a nice wide line. I enjoyed writing with this pens, didn't feel like I was scratching into the paper. I'll stick with the wider point and put the 0.3m pens aside for further thought. I hadn't given much thought to customizing a Rhodia pad until I saw this great job by Gentian, so I decided to give it a try. I don't draw, and my Sharpies were out for an afternoon stroll, so I made a color copy of a favorite portrait I had commissioned a few years back--a miniature of my two cats, Bast's Gift (left) and Pywacket (right). Taped to my current Rhodia 16 pad so there won't be any scratches or marks, and framed with black marker. I found a few other markers to color in the trees, and I have to say I kind of like how this looks. The black ink on the Field Notes memo book is called "Dachshund Nose." Livescribe Digital Pens hit the market a few years ago at places such as Target, Amazon.com, and Costco. 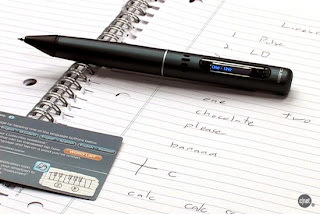 The Pulse Smartpen records and links audio to written text using special notebooks. Once available in 1gb and 2gb versions, Livescribe is now adding a 4gb version that won't cost much more than the 2gb pen they introduced about 2 years ago. This is, quite simply, one of the coolest toys I've ever seen. And I'm seriously thinking of adding it to my collection come Christmas time. Art Brown International Pen Shop is now carrying the De Atramentis inks, a German brand that arrived about two weeks ago. They brought a few dozen colors to the 2009 New York City Pen Show, but not the wine-based or scented inks. Several colors really caught my eye (a teal that was almost neon), but unfortunately others got there before me. One color that I was interested in was Bordeaux Red, possibly because of the color or because of the name. 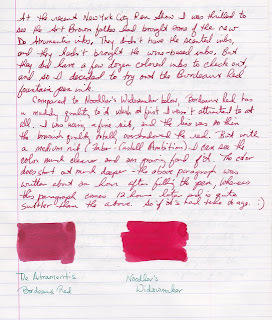 The Bordeaux Red has a definite muddiness to it, so it's not as bright or true as Noodler's Widowmaker. 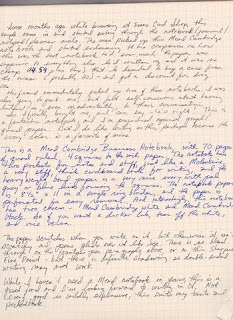 That said, while I didn't think much of it in a fine point pen I did like writing with it in a medium point fountain pen, my Faber-Castell Ambition. The color seemed to stand out on the paper, definitely more a bordeaux red than a claret that needs decanting. If you're interested in a subtler red, this is definitely a color to consider. Recently I received a wonderful Quo Vadis Equology Textagenda Planner to review, along with a bottle of J. Herbin Violette Pensee ink that I'd been meaning to try out as well. Many thanks to Karen Doherty for the gifts of orange and purple, they are much appreciated. And out of the starting gate for the first review of the Textagenda I've seen is Miscellany and Cacophony, with a very thorough examination of the Textagenda and some great pics. I'm going to concentrate on style and utility in this review. Regarding planners, I started using the Day Timer system about 15 years ago, mostly because the company and I both hail from Allentown, PA. But even with a two-page-per-week system, the desk size planner was too large to carry in my bag. I gave it up for a Palm Pilot that was convenient, but I really missed the paper and ink experience of a planner. When the Palm Pilot expired in a tragic accident two years ago, I bought a Moleskine planner to keep track of projects and notes at work. I liked it a lot and would have gotten it for 2009 but I really missed my Day Timer, so that's what I've been using this year. Unfortunately, though my handbags have gotten bigger the desk size Day Timer still doesn't fit comfortably, so I've been looking around for something different that will also fit into my bag. Enter the Quo Vadis Equology Textagenda. When the Equology arrived I was surprised at two things: how bright the orange color of the planner cover actually is, and, given it's a synthetic, it's amazingly silky feel--like fine cloth. The Textagenda is a one-page-per-day planner beginning in August 2009 to July 2010; turns out, it is the same size as the Chelsea journal. So if you'd like to use the Equology cover with a Forum refill as blank journal, it works perfectly. Unfortunately, the reverse isn't the case--you can't use the Textagenda with the Chelsea cover as the Textagenda is much thicker than the Forum refill. The journals both have roughly the same number of pages, although the Textagenda includes world maps, note pages, and address pages. But that's only about 25 or so extra pages, and so I'm guessing that the Textagenda recycled paper is thicker than the Forum journal paper. An interesting situation, as I would have thought the reverse, that recycled paper is thinner. 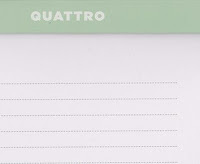 Which segues nicely into the whole point: the Quo Vadis Equology planner is part of the company's recycled green line. The web site touts the recycled paper made from 100% post-consumer fiber, the chlorine-free manufacture, and the overall environmental friendliness of the products. 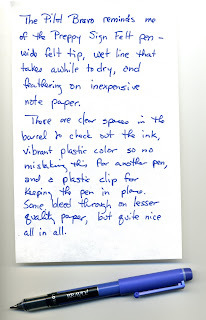 The website also states "Equology paper is crisp, very white, and good to write on." And it really is that, with paper that feels quite substantial to the touch. I've been using the planner every day as both a journal and planner, making notes as well as scheduling my time; I find I like the way the Textagenda "handles" very much, there is more than enough space on each page for numerous notes and cryptic messages as well as two special areas for important points to remember. The Equology Textagenda is the right size, has great writing paper, looks good, and feels even better. Any negatives to this planner? Just one, and only because it's a pet peeve: when removing the Textagenda from the Equology cover I had to bend the front and back journal covers. This caused the cover to open a bit rather than stay flat when closed. Bending the planner back and forth got rid of most of the problem, but if your planner absolutely must be closed when on its side, fortunately for you Quo Vadis has many more great planners available. I was sitting at a colleague's desk writing a note to her when I stopped to notice the pen I had chosen, a Pilot Bravo blue marker. This non-refillable pen reminds me of the Preppy Sign felt tip marker--it has the same type of barrel and wide tip marker that leaves a thick, wet line. The Bravo itself is nicely designed and has two clear panels on the barrel so the ink supply is visible. According to the company, the marker won't dry out if left uncapped, and the ink won't bleed through paper like other marker pens. Perhaps, although I found that it did leave a serious shadow on lesser quality paper, not that I'd use this for double sided writing. Not my first choice of a marker if a Sharpie is around, but a good pen all in all. The blue color itself is a deep, rich hue, not your standard blue but something with more shading to it to make it interesting. I'll probably give this a try on some Rhodia pads, although I'm hesitant to borrow the Bravo as it may never make it back to my co-worker's desk. Another favorite stationery store that I browse a lot is Typewriters 'n Things on 8th Avenue, a block below 14th Street. The store is a tiny sliver of commerce with thousands of notebooks and journals (Rhodia, Miquelrius, Moleskine, Kokuyu, Clairefontaine, Apica minis, Memo brand journals, and Pentalic), pencils and pens (the only store I've found where I can buy a single orange Sharpie fine point for $1.99 or a purple G2 mini for $1.49), desk accessories, notepads, supplies, Autumn-inspired colored Post-It notes in all sizes, and more. The owner, his wife, and their son all work the counter and are very helpful in tracking down an item. In addition, if your typewriter (manual or electric) has stopped working they will repair it, and sell you some ribbons as well. That really tells me how long they've been around, or maybe it's a Greenwich Village thing--would Kerouac have used a Mac or a PC? Dylan Thomas a fountain pen or a LiveScribe? On a recent "buy something orange but not another Rhodia" hunt I spotted this really cute journal called Pentalic a la Modeskin. The Pentalic is for sketching and/or journaling, with 160 pages of 60lb (100gsm) acid-free cream-colored paper. Like the Moleskine, the Pentalic has a ribbon page marker, and elastic closure, a back pocket for notes, and a leather-like, waterproof-stitched cover. Typewriters 'n Things had quite a few in various shapes and colors, but I was fixated on the mini 3x4 in orange selling for $4.95 plus tax. The Pentalic stands up well next to the original Moleskine. One interesting feature is the notched edge where the elastic band lays on the top of the cover, a nice touch that makes for a snugger fit around the paper (which does not come to the exact edge of the cover as in a Moleskine). I haven't shown any written pages because Biffybeans did a great review of the larger Pentalic journal back in 2008 at her blog, Spiritual Evolution of the Bean, and she has lots to say about the writing quality . I can only add that this is a great little journal and an awesome color. My office desk, with various large Rhodia notepads (I love the yellow lined pad, #18 I believe), a gigantic Whitelines orange notepad that I had to have, a Moleskine reporter notbook, a small Doane pad, some Field Notes memo books, stationery from Chelsea Paper, and an assortment of other odds and ends that keep me happy. I have no idea how the food is at Mama's on 3rd Street and Avenue C, but the flag with the skull and drumsticks makes me wonder. Why yes, I did attend the 2009 New York City Pen Show. How did you know? Coming into the ballroom on the mezzanie level I made it past Delta, then the Pen Club of America, but got stopped cold at Swisher Pens by a courtly Chuck Swisher and a Namiki in my favorite colors. Then it was downstairs and making the rounds, where I got tripped up by an interesting Pelikan and a gracious Fountain Pen Hospital associate who let me try out the italic, fine, and medium nibs before finally making a choice. On the left at the top, from the Fountain Pen Hospital, a Pelikan Tradition Series 205 Blue Transparent Fine Point Fountain Pen. On the right, from Swisher Pens, a beautiful Namiki Fine Point Fountain Pen. My very first "good" pens, I'm still in a daze. Plus I also purchased my very first Lamy Al-Star fountain pen with an extra fine nib (from Swisher Pens) and a Faber-Castell Ambition ballpoint (from Art Brown) that I've re-rigged with a Monteverde blue/black gel ink refill that I love; those and a few new inks round out the purchases. Somewhere below is a post on a Zebra Sharbo pen where I mention that I can't imaging spending $150 for a pen. Let me amend that to, I can't imaging spending $150 for a non-fountain pen. Some months ago, while browsing at Essex Card Shop (which can be an all-day affair in itself), this couple came through the notebook/journal aisle to pick up a few things. The guy was ecstatic when he saw the Mead Cambridge Business Notebook, exclaiming to all (his girlfriend and me) that this was THE. BEST. NOTEBOOK. EVER. and he loved it so much he'd bought a case from the Shop's owner and got a nice discount. 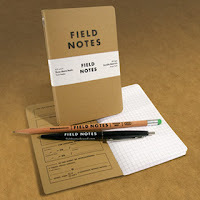 At $4.59 plus tax, the notebook is priced at more than a regular Mead notebook and slightly less or about the same as a much smaller Rhodia or Clairefontaine. Now I was really intrigued, but didn't want to seem like I'd been eavesdropping (hard to do in that small space) so I didn't buy one then. On a recent trip to the Shop I decided the time was right and bought one. And he's right, this is a fantastic notebook; as I don't care for graph or quadrille blocks on my writing surface (except for Doane Paper), that's quite something. I've gotten to like writing in this notebook, perhaps because the deep ivory color is a favorite of mine and the lines are so light they don't distract from the words. The heavy ivory paper scritches when you write on it, but otherwise it isn't scratchy and doesn't interfere with the pen moving smoothly across the surface. I tried it out with two fountain pens and a Sharpie fine point, and there is no bleed through but there is a decent shadow effect, so double-sided writing may not be possible. I havent used a Mead notebook in years, but this is a great find and I will keep it in the immediate rotation for work and home use. It's wallet-friendly and good-looking, two things I do like in my notebooks. This is a bit different, not a pen review but a color review. This is one of the Pilot Hi-Tec-C .5mm pens I bought awhile back at Kinokuniya in a very distinctive color called Bengara. According to the JetPens website, Bengara (Ferric Oxide Rouge) is one of the Yawaragi colors (literally "being softened color"), a fairly new pastel color of which there are five total. 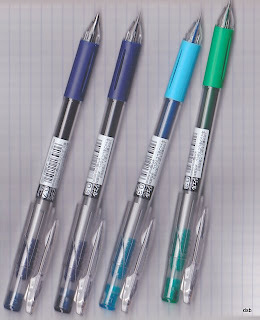 JetPens carries the Yawaragi colors in .3mm and .4mm, but Kinokuniya carries them in the .25mm and .5mm widths as well. My personal favorite is the .5mm, which I find writes more smoothly for me than the .25mm and .03mm, although it's very close in feel to the .4mm. In the Hi-Tec-C line I favor the largest width, perhaps because it is a needle point rather than a rollerball. Ferric oxide rouge is also known as iron oxide red; a very fine powder of ferric oxide is called Jeweler's Rouge and is used to put the final polish on metal jewellery and lenses. As a cosmetic we know rouge nowadays as blush or lipstick. Ferric oxide can range in color from light red to dark violet, but deep, soft red-brown is probably the most standard formulation of the color. And that's what Bengara looks like, a pinky-red with some brown in it, a very different combination of color that is neither one nor the other. It's a lovely shade, and until I started playing with color more I might have passed it by as impractical. Now, it's in the box next to the orange and green gel inks. RevolveR Bound Journals, probably one of the most creative journals ever made. Both Unposted and OfficeSupplyGeek have great reviews of the RevolveR Bound Journal, and OfficeSupplyGeek met Ellen and Matt Dudley at the National Stationery Show in May 2009 and got to see the RevolveR back then before any of us heard about it, much less saw it. So I was really excited when I received an email from the Dudleys explaining the RevolveR and asking if I would like to review one of the journals. I was absolutely thrilled; since I actually live close by their design studio, we were able to set up a time for me to come by to meet them and talk about their unique notebook. Revolver is located at 131 Essex Street, on the corner of Rivington in an elderly tenement that was probably once a workshop. For those with a sweet tooth, the awesome Economy Candy Store is a few doors down on Rivington, and the Essex Market building is a block south. 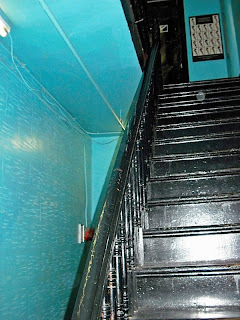 Up four flights of stairs painted deep black that contrasted with the rich turquoise walls is Revolver Bound Books and Journals, sharing a large loft space with six other creative designers who work in precious metal and cloth. Ellen Dudley greeted me at the main door and later gave me a quick tour of the fourth floor space. A warm, gracious woman with short blonde-brown hair, Ellen has a friendly demeanor and a twinkle in her eye. Unfortunately, Matt Dudley was under the weather and thus we didn't meet, but I spent a great hour sitting with Ellen and the better part of 150 cases of RevolveR journals. Revolver Bound Books and Journals is a new venture for the Dudleys, who had been in the book business for 16 years prior packaging books for publication. The idea for the RevolveR Journal with its floating spine came from working on a book for young readers about time. As Ellen explained, she became intrigued with the concept of time twisting around and of creating a circular story. She was also interested in journaling, the idea of keeping lists and jotting ideas down so that the RevolveR became a tradition object with a twist, literally. The dual journal has received a lot of attention from museums as a design concept piece as well as a functional tool. As we talked about the nature of time, journaling, and the invention of the pencil, Ellen mentioned that people who pick up the RevolveR have a definite idea of how to use it. She's had suggestions from people to put a Guide to Birds in one half and keep the notes section in the other so they could use it for their birding activities; another suggestion was for a Guide to Paris, and the notes section would be for their favorite places and memories. Small to large companies have shown interest in the RevolveR and the journal got a great reception at two recent shows, the National Stationery Show and the New York International Gift Fair. A fellow vendor told Ellen that the RevolveR was very Zen, embracing duality with a circular feel. And the ongoing response has been very exciting: RevolveR Bound Journals can be found at 10 stores nationwide, including: Flight 001 and Giant Robot, both with stores in New York and San Francisco; Exit 9 and Print Icon in New York; Warwick, in La Jolla, CA, ; Barrington Books in Barrington, Rhode Island; La Grua's in Stonington, Connecticut; and Paper and Chocolate in Dallas, Texas. The RevolveR can also be found at the following museum stores: Museum of Contemporary Art in Chicago; the Walker Art Center Shop in Minneapolis; and the Minneapolis College of Art and Design Art Cellar in Minneapolis. Several more stores will be stocking RevolveR soon, and the flexible spine technology is available for licensing (a great idea for corporate logos and university insignias). The Journal is also available at RevolveR Bound Journals, and their web site has a great video showing off the Journal's flexibility. The RevolveR Journal itself comes in two sizes and four colors, and opens up in an ingenious fashion that has been reviewed elsewhere (links above). There are two 64-page sewn folios, one blank and one lined for all your note-taking and other needs. The outer paper, which feels more like a matte vinyl or Moleskin-like leather, is bonded with a water based acrylic paint and made by Ecofiber, giving the paper a classic feel while being environmentally sound. Down the line, the Dudleys are looking to expand the line and Ellen showed me a prototype of the RevolveR Pops, a smaller, thicker journal in beautiful neon colors (orange, pink, red, yellow). If the Pops comes to pass they will add an extra element of fun to an already stylish concept. As much as I loved the Pops journal it wasn't leaving the design studio, but Ellen generously offered me my choice of a journal, which she wrapped so artfully in brown paper that I didn't open my Little Blue RevolveR for several days. But now it's in among the journals in my bag, and I get a lot of questions and compliments every time I take it out. An extraordinary idea for a great journal! If you are near Madison Square Park at 5th Avenue and 23rd Street starting October 9 through November 1, the Dudleys will have a booth showcasing the RevolveR Journal at the Madison Square Mark't. Stop by and check out the blue, green, red, and silver revolving journals. Many thanks to Karen Doherty, Vice President of Marketing at Exaclair, Inc. for the Equology Textagenda to try out and the bottle of J. Herbin Violette Pensee ink. I've already loaded the ink into a pen and started marking up the Textagenda, and will post a review soon. The Equology journal is quite nice, and the Textagenda is the same size as the Chelsea journal so I'll have some side by side comparison pictures. Just an FYI to New Yorkers and visitors to the Big Apple, Madison Square Mark't at Madison Square Park (23rd Street between 5th Avenue and Madison) begins Friday, October 9th through Saturday, November 1, 2009 from 11 am to 8 pm daily. There will be a Food Square in the area between Broadway and 5th Avenue from 24th to 25th Streets featuring BBQ, tacos, pork buns, and more. The Mark't shopping will be on the 5th Avenue side of the Park from 23rd to 25th Street features unique goods such as Revolver Bound Books and Journals. Matt or Ellen Dudley will be there daily showcasing their RevolveR Journal. Drop by and see their really unique time-and-space-twisting journal in person. It's the Rubric's Cube of notebooks. I had the chance to meet and interview Ellen at the couple's design shop on Essex Street, and my review of the RevolveR Journal will be posted next week. But do stop by the Mark't if you're in the neighborhood and say hello to the Dudleys. Shown above from the side is the RevolveR Bound Journal Little Blue. 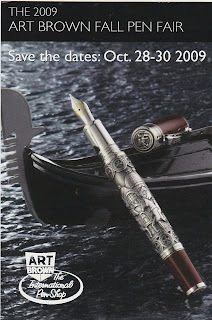 The 9th Annual New York City Pen Show begins today and runs through Sunday, October 11, 2009. I have been looking forward to this for some time, and will probably drop by Saturday. The Show is at the Park Central Hotel, 870 Seventh Ave. at 56th Street. Times are Friday, October 9th, from 11 am to 7 pm; Saturday, October 10th from 10 am to 5 pm; and Sunday, October 11th, 2009 from 10 am to 4 pm. All three days are open to the public, and I believe admission is $10 a day. While hunting through the office supplies section at Rite Aid I came across a pack of Pentel Ultra Slim Handy-Lines, a retractable permanent marker that's also refillable. I like both ideas but especially the latter, as I really would rather not throw plastic things away. Billed as a fine point, the Handy-Lines marker is made from 55% post consumer recycled plastic and is part of the Pentel "recycology" campaign. The marker has a broad stroke, and the bleed through is spectacularly impressive--two sheets of Doane Paper were sacrificed, something I've never seen with any other marker I've tested before. Definitely a great marker for writing on CDs or DVDs or for other projects, but not for general note writing on paper. 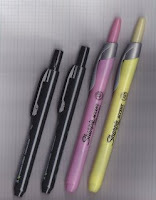 The other two-pack that caught my eye was a set of Sharpie Accent retractable highlighters in yellow and pink. The feature Smear Guard technology, which resists smearing of many pen and marker inks. The pic to the left doesn't really capture how bright the colors are, but you can definitely see there was no smearing. I used it over the Handy-Lines marker, and almost no black ink was picked up on the highlighter tip (a yellow highlighter with black ink on the tip annoys me to no end). These will be tested against some gel and ballpoint inks, but the Sharpie Accents seems to be a great find for me as I want to highlight notes I make as well as books and magazines. I was reading Julie aka Okami's blog post about her new Handbound Steampunk Journal that she bought from Rhonda Miller at Etsy, and decided to see if there were any interesting fountain pens for sale. And boy, were there ever! I fell in love with a handmade pen by Robert Parrish that is beautiful and functional. He sells a number of handmade wooden items, including hair accessories, boxes, and crochet and knitting needles. As someone who crochets, I was interested in the handmade crochet hooks which look incredible and would add a dash of fun and elegance to any crochet project. The Southern gem wood fountain pen I purchased is dyed, laminated hardwood in bright pink, green and turquoise colors, which I hope my picture shows (the first one above was taken by Bob Parrish for the Etsy website). It is certainly a colorful pen in person, and there were many ooohhhs at the office when I unwrapped the package. The flat top fountain pen has threads at nib and end, so when I take off the cap I have to remember not to pull but turn, same with putting the cap on the end of the pen when I write. The German made Iridium fine point nib is trimmed in 24 kt. gold plating; all in all, a superb purchase. Bob also included an international size ink cartridge and a converter for bottled ink. I filled the converter with Noodler's Boston Brahmin Black and have taken it for several test drives. The nib is smooth over the various papers I've written on, and the pen is nicely weighted and has a great hand-feel. What is also a bonus is that you can request either a fountain pen or roller ball, so if you're more interested in the latter you need only ask. Like Julie and her journal, I will treasure this pen and use it as much as possible. The Third Carnival of Pen, Pencil & Paper is being hosted by OfficeSupplyGeek, and there are some great submissions. To submit posts to the Fourth Carnival in November, apply here. While browsing at the Essex Card Shop a few weeks ago I was looking over the pens and decided to get something unusual not just ink-wise but with a larger point width as well. This Uni Ball Gel Impact pen scores on all counts. It is one of the heaviest pens I've used outside a broad fountain pen, and it is also one of the most aesthetically pleasing. The cap is curvy, and the pen color shades from dark gray to light gray and back again in a really lovely manner. The pen clip is also curved-there are no hard edges on this pen. 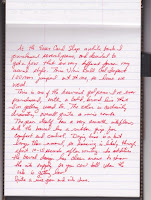 The cap has a band of color (in this case red) to let you know what you're about to write with, while the barrel has clear oval windows, again in this case clear red, to let you see the remaining ink in the cartridge. I like ballpoint gel ink pens, they write smoothly and remind me of the whole ballpoint experience without the spidering ink or dots of messy color. This is definitely a smooth writer, and with a 1.0mm width on the point it is a broad flowing line. The barrel has a rubber grip for comfort and greater control. Most likely because of the broadness of the point, the ink takes a longer time to dry and may smear after 10 seconds. Not necessarily a good option for lefties then. On the whole, this is a very solid-feeling gel ink pen, and a definite choice if you like the Pilot G2 but want a more mature look to your pens. Of course, the red ink--which practically glows--may not be your choice, but there are other colors to choose from. My neighborhood drugstore, one of those old-fashioned mom-and-pop places, doesn't carry much in the way of office supplies. A lot of bubble mailers, Mead notebooks, and Bic pens as well as some of the cute 99 cent stuff like pencil sharpeners and erasers. So I was surprised to see these Post-it® Padded Cards--something I didn't know I needed until that moment. I bought two packs (white plain and lined), leaving the lined yellow-blue-green pack for another day. I'm thinking this is old stock they've had around for years without anyone really noticing (myself included). When I checked 3M's website I couldn't find any information on the Padded Cards; only when I ran a search did this one reference come up: Post-it® Padded Cards with restickable adhesive allow you to visually organize your tasks and ideas. They are durable, portable, and easy to carry with you wherever you go. Stick important information in planners, notebooks, files, & other organizers. Which makes me wonder how old these are, and whether they've been discontinued. The Padded Cards are a really great idea. Each pack contains 50 cards almost the size of a 3x5 note card; they are made from a heavy paper stock and are quite thick. I decided to split off cards and stick them in various notebooks (Moleskine, Rhodia, Field Notes) for those times when I want to add something or, more likely, for when a colleague asks if I have a piece of paper to write on. If I'm using a tablet, tearing out a sheet isn't a problem. But lately I've been carrying journals, and it's annoying to rip out a page just to right a sentence or two. Now I can just pull off a Post-it® Padded Card and my journal is saved. This pic shows some of the cards in the back of a Field Notes journal. The pack sold for $1.49 plus tax, and I'll be heading back for a few more packs. I don't go anywhere without my Kindle DX, the larger Kindle with the 9" screen. I subscribe to two daily newspapers (the Financial Times and International Herald Tribune) and one monthly magazine (Asimov's Science Fiction). In addition, I have lots of books I can read on demand, heaven if you're a reader. And I can scan a book into a pdf file and download it to my Kindle, so I can also read books that aren't available as an ebook on Amazon.com if I don't mind spending a half hour at my little scanner. That's to the right in the above pic. To the left are my supplies for taking notes on several books I'm reading right now. In the front is an Orange Field Notes memo book (general notes), followed by an Apica notebook in the middle (for notes on The Core Balance Diet), and a Rhodia orange journal at the back (for notes on The Anastazi Method). The Kindle is set up to take notes, but they are all lumped together in one folder, and I don't like skimming through 20 pages to find something. So I deal with it the old-fashioned way: I take notes. Right now I'm using a Muji gel pen 0.38mm black ink, a Pilot Hi-Tec-C .05mm in the Bengara color, and a Sakura Pigmo .05mm with purple ink. And if I don't feel like reading or writing, I can use the Kindle to surf the internet--high-tech, low-tech, no-tech all in one pink pebbled leather case! My girl Seranne has discovered that this blue thing, known to us humans as a heating pad, is really great to sleep on when that strange orange light is lit. Must be powered by Rhodia. Leah Hoffman at Quo Vadis Blog posted about a Notebook tote bag she found at Fish's Eddy, one of the truly unique New York City shopping experiences. As I was headed in that direction I stopped by and bought one, as well as a coffee mug with the same notebook design. The graph paper items are 50@ off, as are the very interesting beginner's writing paper series (which has an additional broken line between straight lines to learn the height of letters when writing). Really lovely greens on this tyvek bag, different shades of olive. The sides of the bag show the Fish's Eddy logo and the beginner's writing paper style and graph paper style; all in all, quite nice. There are some really interesting heavy ceramic boards you can buy in graph, beginner's, or straight line styles that have holes punched on the side as if to fit into a three-ring binder. After trying to puzzle this out (carving board? pastry board?) the sales clerk explained they were for serving cheese. As they were also $24.95, I thought I'd pass. The tote is $3, the notepaper mug is substantially more, but I decided to splurge. I couldn't even imagine spending $150 on any pen let alone a multi, but if I did it would be this Zebra Sharbo X TS10 in Bronze Ocher (bottom pen). Then again, three pens plus a pencil, so that's really "only" $37.50 per writing instrument, just a touch higher than the Lamy Al-Star I'm thinking of purhasing. Well anyway, that is a beautiful looking multi and a fantastic color. 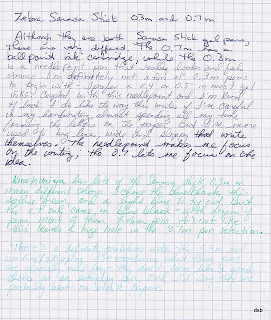 JetPens really has the coolest stuff to make a pen-and-paper-addict lose her wits. The Art Brown International Pen Shop's Fall Pen Fair will be held Wednesday October 28 through Friday, October 30, 2009 from 9:30 am to 5:00 pm. The new Tibaldi Hercules, Omas Lamborghini, and Montegrappa Barbiere Di Seviglia will be premiered at the show. Art Brown is located at 2 W. 45th Street, just off 5th Avenue. I definitely want to check out the new Lamy Al-Star fountain pen in purple and premiering at this Fair. 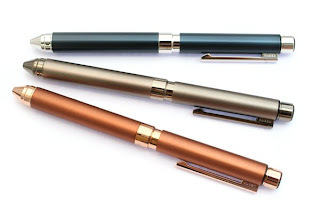 And I will have to check out this Omas limited edition fountain pen--I don't think I would dare breathe near it let alone hold it, but I would love to see it. I imagine this was thought up in those heady days before our mortgage-backed-and-credit-default-swapped-economy went down the drain and hedgies and top traders were earning their $50 million to $100 million (and those were just the good ones, not the greats of Wall Street and Greenwich, CT). Update on some Coming Soon items: called Art Brown and was told the De Atramentis inks were shipped this week from Germany, but haven't arrived at the shop yet. I'll get a call when the wines, fruits, flowers, and sweets are delivered. Walking through Paper Access on W. 18th Street, I notied the very large section of Sakura pens, including the Pigma and these Gelly Rolls. 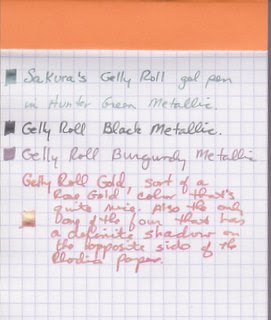 Naturally I had to check these gel inks out, and so I bought a few to try: hunter green metallic, burgundy metallic, black metallic, and a whimsical rose-gold color. The pens are about $2.25 plus tax each, and I do like the aesthetic--the rounded cap and sparkly plastic appeals to me quite a lot. They are certainly a lot longer than regular gel ink pens, something I also like as they have more ink to play with. The writing is quite nice. The pen has a roller ball point that glides smoothly over the paper. The Metallic colors are, interestingly, more muted while the Gold gel ink pen is very strong and shiny, and leaves a definite shadow on the opposite side of the page. The Metallic black looks almost dark grey in some light, not a very deep black. Same with the hunter green and burgundy: the name implies a much stronger pigment than what actually shows up on the paper. I think the greatest appeal is the wide selection of colors and styles. I will have to look for green, burgundy and black in the Gold style to see how those look next to their Metallic counterparts. I finally got to A.I. Friedman on W. 18th Street a few days ago, and am still in sensory overload from all the fantastic stuff they have in stock. One particular journal I'm planning on going back to get is part of a Disney set, not something I'm usually interested in but this one featured a great picture of Minnie Mouse. One notepad I liked the minute I saw it was the Quattro by Global Art Materials. These notepads come in a number of shapes and sizes, and in grid, lined, and blank acid-free paper that feels similar to Clairfontaine (very heavy, no bleed through or feathering, very light shadow so double-sided writing is fine). In addition, the sheets are perforated for easy removal, and the lines themselves are tiny dots rather than a thick line (see pic below). The Quattro I finally purchased is a 3.4" x 5.5" notepad with a heavy paper-stock cover that folds back like a reporter's notebook. It's priced at $2.99 plus tax, and available at a number of stores (Blick, Sam Flax, etc.). The Quattro comes in many different sizes, and there were several I would have purchased but for one small problem: they were avocado green, a color I absolutely do not like. This little notepad was the only one that came in pale mint, and while I would like it in a larger size I had to make a trade off for getting a color I liked. Global Art Materials also makes a leather cover for this size notepad, again similar to a Rhodia cover, for $19.99. The leather cover is a nice idea, but the Quattro itself is good looking and sturdy, making it a cute addition to my collection.